If the output spans more than one page, press the spacebar to display the following page of commands, or press Enter to go one command at a time. To quit the output, press q. In the picture above you can see that we’ve displayed all commands that start with de. In the picture above you can see that we’ve displayed all commands that can follow the command debug. 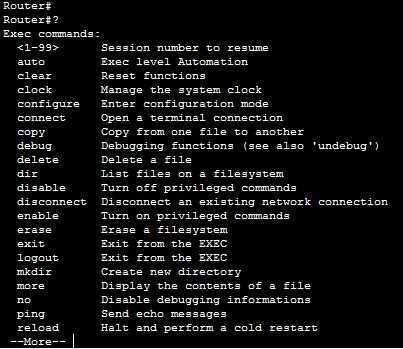 We then displayed all commands that can follow the commands debug eigrp. You can also autocomplete a command. Just type the first few characters and press Tab. If there is only a single match, IOS will complete the command. The % Ambiguous command: “show ip in b” message was displayed because the third keyword, in, has more than one meaning (inspect or interface).